Heat oven to 350°F. 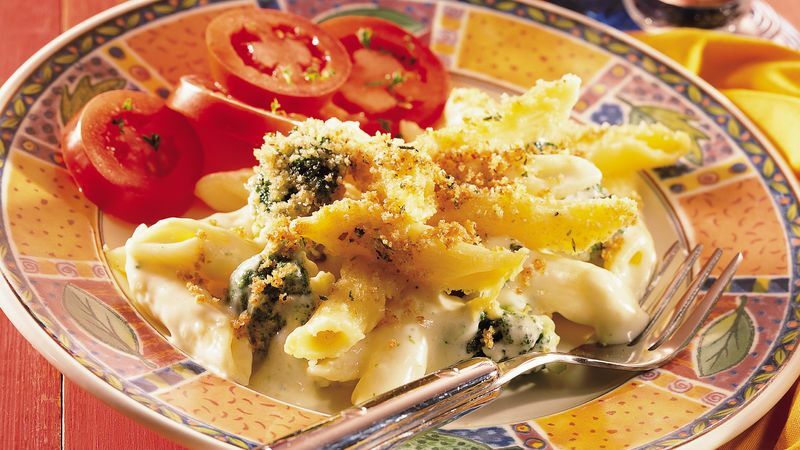 Cook penne to desired doneness as directed on package, adding broccoli during last 3 minutes of cooking time. Drain. Meanwhile, melt 1 tablespoon butter in large saucepan over medium heat. Add flour and salt; cook and stir until well blended. Gradually add half-and-half, cooking until mixture boils and thickens, stirring constantly. Remove from heat. Add Havarti, colby and Parmesan cheeses; stir until melted. Add cooked penne and broccoli; mix well. Spoon into ungreased 8-inch square (2-quart) baking dish or 2-quart gratin dish. In small bowl, combine topping ingredients; mix well. Sprinkle over top. Bake at 350°F. for 20 to 30 minutes or until casserole is bubbly and top is golden brown.